Farewell to Fossil Friday.... For Now. Well folks, this will be the last Fossil Friday for a while. Next week we will be debuting a new feature in its place. This isn’t because we don’t love fossils—we do!—nor is it because we have grown tired of Dan Coleman and Dan Phelps’ Fossil Friday dominance. What oh what is this funny thing? It looks like a particularly beautiful topographic map. Of course, that’s not what it is. Can you figure it out? First to get it right wins heaps of praise. 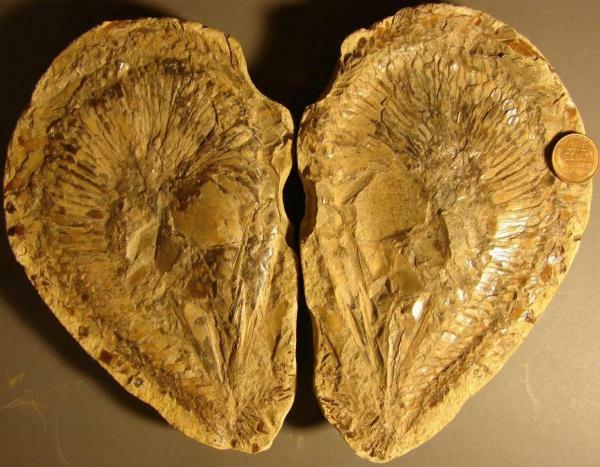 It’s the goniatid—or if you prefer the goniatite—Imitoceras rotatorium, and what’s not to love? Stephanie Keep recently told you about the collective NCSE fondness for cephalopods, and goniatites are cephalopods found in the fossil record from the Devonian to the end of the Permian; they resemble their later cousins the ammonites. Again with the swirliness! But it’s not a summer repeat of the edrioasteroid. What, then, is it? If you think you know the answer, write it on a postcard or a scanning superconducting quantum interference device microscope—you can never have too many, right?—and mail it to NCSE, 1904 Franklin Street, Suite 600, Oakland CA 94612. Or just leave a comment below. Not as cuddly as a bunny, but cute nevertheless, it’s Streptaster! One of the Edrioasteroidea, a class of echinoderm, Streptaster “is distinguished by the very high, long, and strongly curved ambulacra, all of which curve counterclockwise,” as the University of Georgia Stratigraphy Lab notes. The biologist J. B. S. Haldane supposedly said that the discovery of a fossil rabbit in Cambrian or Precambrian—accounts differ—strata would definitively falsify evolution. The Ordovician would be dicey, too. Therefore, as you contemplate the Ordovician charmer above, do not substitute “bunny rabbit” into the following: “Just what I always wanted. My own little _____. It’s a trilobite, sure; who didn’t know that it was a trilobite? But congratulations to Dan Coleman for identifying the genus: Flexicalymene.